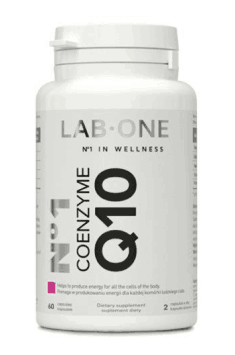 No1 Coenzyme Q10 by Lab One is a dietary supplement containing a reduced form of coenzyme Q10, that is ubiquinol. It is a naturally-occurring form in the organism characterised by maximum absorption. The ubiquinol contained in the preparation is obtained from natural yeast fermentation and is exactly the same as the one synthesised in the organism. Moreover, it is free of pollutants and cis isomers, and the capsules are made of plant cellulose, thanks to which the product is absolutely safe and suitable for vegans and vegetarians. Coenzyme O10 – also called ubiquinone, is an organic chemical compound occurring in the mitochondria of plant and animal cells. It is particularly important for the functioning of organs with increased need for energy, e.g., the heart or the muscles. Coenzyme Q10 is a strong antioxidant, which means that it protects cells from the harmful influence of free radicals, decreasing oxidative stress in the organism. That way, it slows down all kinds of aging processes of the organism. It takes part in ATP synthesis, thanks to which the mitochondria work better and more efficiently. Coenzyme Q10 has also been demonstrated to strengthen the human immune system by producing NK cells – Natural Killers, which are essential for the fight with pathogens, viruses and bacteria. It also helps to burn fatty tissue, supports endurance and muscle strength. Oxidative stress is the state of imbalance caused by a higher amount of reactive oxygen species (ROS) than antioxidants. Such a situation leads to damage on a cellular level, DNA mutation, increased risk of cancer, atherosclerosis, neurodegenerative diseases and accelerated aging processes of the organism. The use of substances with antioxidant properties, including coenzyme Q10, helps to eliminate the damage caused by the activity of free radicals. Coenzyme Q10 takes part in energy production in cells, thanks to which it improves, regulates and strengthens the action of the heart. Research shows that doses of 300 mg per day for 8 weeks can reduce the rate of heart attacks and ischaemic heart disease by ca. 40%. Moreover, its proper concentration provides protection against atherosclerosis, mainly by regulating blood cholesterol levels. It decreases the concentration of the LDL fraction and triglycerides and increases the level of HDL. Additionally, it can reduce arterial blood pressure and normalise glycaemic index. Coenzyme Q10, thanks to its great antioxidant properties, has a positive influence on maintaining healthy and beautiful appearance. It nourishes and improves the work of mitochondria, which are considered the powerhouse of cells. By the same token, supplementation with coenzyme Q10 adds vitality, energy and prevents aging of the organism. The compound takes care of the firmness, elasticity and proper nourishment of skin, which is why we often find it in the composition of rejuvenating creams. To sum up, Lab One No1 Coenzyme Q10 is a dietary supplement containing coenzyme Q10 in the most assimilable form. The preparation helps to eliminate the harmful effects of excessive oxidative stress and allows a healthy appearance of your skin. The product is particularly recommended for people who want to take care of their health and everyday energy levels in a complex way. No1 Coenzyme Q10 60 caps. Take 2 capsules a day after a meal in order to maximise absorption. Coenzyme Q10 is fat-soluble, so it should be taken with or right after a meal. Normally, the recommended daily intake of coenzyme Q10 is 90 to 200 mg, which corresponds with the dosage suggested by the producer (1-2 capsules). Interestingly, the effects of supplementation with coenzyme Q10 does not depend on the dosage and the lowest recommended dosage, that is 1 capsule daily, can definitely prove to be enough (and more economical), especially when your purpose of supplementation is mainly preventive. Coenzyme Q10 absorption depends on the presence of fat, so it works best when taken with a high-fat meal (with olive oil or coconut milk). Thanks to its ability to stimulate energy production in the organism, the compound will prove perfect in times of increased physical or intellectual effort. Even a few weeks of regular supplementation with coenzyme Q10 will be enough for you to notice its beneficial effect on health. Lab One is a Polish company offering exclusive wellness products designed by a team of specialists on chemistry, dermatology and cosmetology. The line of dietary supplements by Lab One is a combination of carefully selected materials and top standards of production, thanks to which you can enjoy your health for longer. The company Lab One also offers face, hair and body care cosmetics created with the use of the advanced method NanoFuture Technology that facilitates the permeation of active substances deep into the skin. Microcrystalline cellulose, magnesium salts of fatty acids, silicon dioxide, glazing agent: hydroxypropylmethylcellulose; gelling agents: carrageenan, potassium acetate. A unique composition of substances mitigating headaches. Butterbur extract. Multi-ingredient and complex formula which adds energy, strength and supports the nervous system. Complex vitamins enriched with magnesium. It supports immunity, regulates metabolism, and acts pro-health. A dietary supplement providing vitamin D3 of plant origin. Helps to maintain healthy and strong bones.